Part of canning is learning how to properly seal the jar. If you screw this up your preserves may develop botulism which can be fatal. 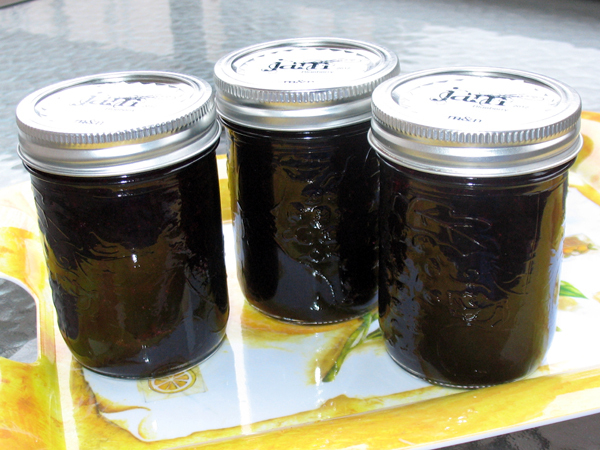 Storage: if the seal is correct, jam can be stored for up to 6 months in a cool, dry place. Once the jam is opened it needs to be refrigerated. Any jar that did not seal correctly should be refrigerated and consumed within 2 weeks. Spoilage: visible signs of spoilage may not appear right away, it can take time for bulging or leaking to occur. When you open a jar, watch out for discolouration, mold, or weird odors. Sterilization: equipment must be sterilized before you put the ingredients together. Sanitize jars in the oven, pre-heat to 108°C / 225°F and heat jars for 10 minutes, then keep in the hot oven until needed. Sanitize lids in a pot of steaming (not boiling) water, keep in hot water until needed. Rings do not not need to be sanitized. Don’t tinker with the recipe. Doubling the batch or skimping on sugar will cause your jam to not set. Place canning rack in canning pot, fill with water about halfway. Simmer and cover. Sanitized jars should be in hot oven, sanitized lids should be in hot water. Crush fruit with a potato masher (if the fruit is frozen microwave it first). You need to obtain 5 cups of crushed berries (this is not 5 cups of whole berries). Once you have enough fruit, transfer to a large pot (not your canning pot). Add the sugar/pectin mixture to fruit. Give it a good stir. Put pot on stove and bring to a boil, then stir in remaining sugar. Increase heat til you achieve a rolling boil (can’t stir it down). Let pot boil for 1 min, stirring often. Remove fruit from heat, stir and skim for 5 minutes. Gently pull skim up and away, and discard. Remove jars from oven, place a funnel into a hot jar. Use a fresh measuring cup to spoon the jam into the jar. When the jar is nearly full, use the headspace gauge to reach ¼”. Use the end of a measuring spoon to gently stir out air bubbles. Wipe the rim of the jar clean when you are done. Use magnetic lifter to get the hot lids onto the jars. Use your finger tips to screw the ring onto the jar. You don’t want it super-tight, because the air in the jar will expand as the hot jam heats it up, and that hot air needs to be able to escape the jar, to create the vacuum seal when the jar cools. Use jar lifter to set jars in canning pot. Turn up the heat until you have a full rolling boil, then cover and cook for 10 minutes. Use jar lifter to remove jars from pot, and set into a lined pan. Leave room between jars for air to circulate. Let jars sit undisturbed for 24 hours. You should hear a “pop” as the jars cool. The next day check the seal. (If you have sealed your jars correctly, you can pick them up by the lids without the lids coming off.) Remove the rings, the lids should be “sucked down”. Press down on the centre of the lids with your finger.If the lid springs up after you take your finger away it did not seal.